With sadness I report today the passing of Frank (Len) Rich, one of Canada’s most active outdoor enthusiasts and conservationist. Unfortunately, I was not able to get to know Len all that well before he passed away. Before I joined the Outdoor Writers of Canada (OWC) we exchanged a few emails and a couple of phone calls. 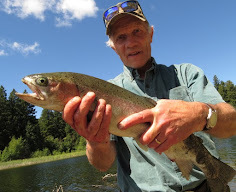 It had been his enthusiasm about everything to do with fishing, the outdoors and writing, plus his tireless commitment to recruiting new outdoor writers that made me join the OWC. Below I copied the official obituary released by the OWC. My heartfelt condolences go to Lens family and many friends in the outdoor community to whom he has given so richly and never asked for anything in return. The legacy he left behind will be carried on in his memory. May you rest in peace Len. We regret to announce the death of Leonard Frank (Len) Rich on April 13, 2009, in North Bay, ON following a brief courageous battle with cancer. He was 71. Len was born and raised in the small Upstate New York town of Whitehall. After eight years of US military service he settled in Newfoundland in 1966. His careers spanned more than four decades, from sales rep and sales manager to automotive dealer and entrepreneur in the field of tourism. His greatest passions were fly fishing and writing and as a columnist, author and advocate for responsible stewardship he left a profound legacy, touching the lives of many throughout the writing and fly fishing worlds. Len discovered and later developed a fly-in sportfishing lodge in Labrador he named Awesome Lake Lodge. He operated that business for 10 years before semi-retirement. He authored several books, including Newfoundland Salmon Flies and how to tie them, Best of In The Woods, Fly Fishing Tips and Tactics, Rivers and Woods, So you want to be an outfitter, Memoirs of a fly fisher, Tales of Christmas (Editor), and his latest Bill Bennett: Pioneer Bush Pilot and Outfitter. He also wrote hundreds of magazine articles for various national and International publications. During his careers he was employed by the Newfoundland government as Hunting & Fishing Development Officer and by the Atlantic Salmon Federation (ASF) as manager of Special Events. Len was also employed by Corona College in Grand Falls-Windsor as Director of Communications and Tourism Training. He and his late wife Ruby developed and operated businesses in Clarenville, NL, known as Whitehall Country Inn and The Grapevine. He was predeceased by Ruby in 2004. He served three terms as President of the Labrador Outfitters Association and three terms as Eastern Director of the Outdoor Writers of Canada (OWC). 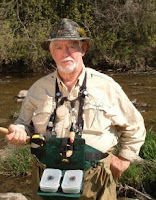 An award winning writer, he was recognized by the New England Outdoor Writers Association and the Outdoor Writers of Canada for his books and articles and in 1991 received the coveted Canada Recreational Fisheries Award for “writing that influenced a generation of recreational fishers.” In 2007 he was selected to receive the OWC’s Jack Davis Mentorship Award for his work with up and coming writers. He led the OWC Mentorship Program and for a decade he hosted the Creative Writing forum on the Sympatico Internet site. Throughout his adult life he made Newfoundland his home, but recently lived in Orangeville and North Bay, sharing his life and love with his partner Susan Buckle. He is survived by brothers Wayne, Shrewsbury, Vermont; Keith, Hoosick, NY; sister Dawn in Massachusetts; Susan and her children Cameron and Lianne Honeyborne; sons Len Jr. (Chantel) of Lewisporte, NL and Ken of Summerside, NL; daughters Lori (Tony) of Fort Nelson, BC, and Tammy of Summerside, NL; stepson Tony Blackmore and stepdaughter Roxane Bailey (Chris) of St. John’s, NL; and grandchildren Cassidy, Alicia, Evan, Tyson, Tyler, Mallory, Morgan, Rebecca, Daniel, Kennedy, and Andrew. Funeral will be held in Clarenville, NL Saturday April 25 at Fewers Funeral Home, Clarenville. 709-467-2468. In lieu of flowers donations can be made to the Margaree Salmon Museum, NS. Margaree Centre, NS B0E 1Z0 or the charity of your choice. Images courtesy of Outdoor Writers of Canada.